Lot’s of news this week. We got our Certificate of Occupancy (C.O.) on Wednesday! We can officially occupy our home this weekend. We worked like crazy last week and over Christmas to finish all the odds and ends for the final inspections. We finished all the electrical Wednesday, 12/21, and had the final electrical inspection the Friday before Christmas. Our water test results arrived Christmas Eve. We spent the rest of Christmas weekend finishing up the porch railings and temporary stairs for the final inspection on Tuesday, 12/27. 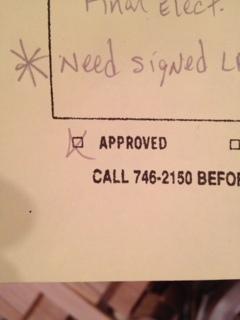 Our inspector gave us the thumbs up and faxed us the C.O. on Wednesday. 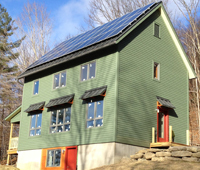 But wait, there’s more… Our contractor Warren entered the Energy Star program with our house. In order to complete the program and qualify under the 2011 rules, we had to get our final inspection and blower door test before the end of the year. This happened Thursday, two days before the end of the year. 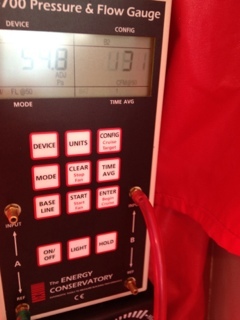 Final blower door result was 131 cfm, an improvement of 28 cfm from the shell test we did back in September. We’ll post more information on the Energy Star process next month when things settle down. It’s the only certification we’ve chosen to do for the house. 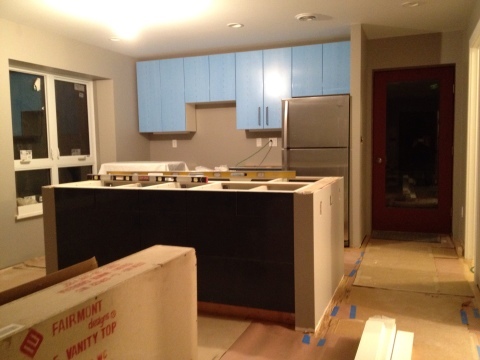 Our kitchen counter tops also arrived yesterday and were installed. 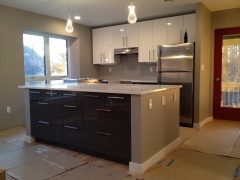 The counters are Cambria Quartz (color: White Cliff.) 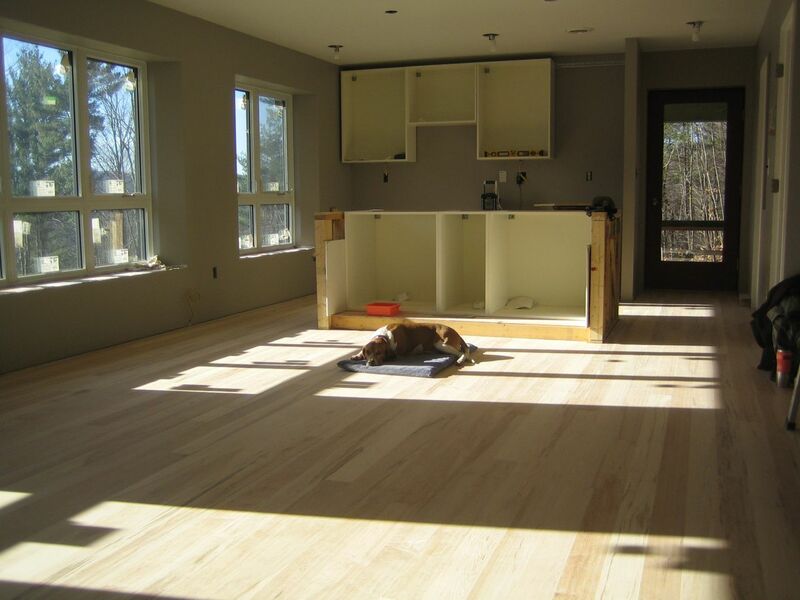 We chose a manufactured quartz counter because we wanted something durable and low maintenance. And we chose Cambria because it’s the only American company manufacturing quartz counter tops. It looks fantastic. 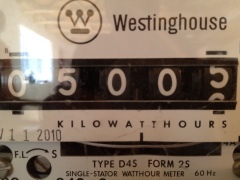 And we generated our 5th megawatt Thursday. It took us almost 60 days to do it. That’s 5 megawatts for half a year. The system went online June 2nd. We have a few finish work projects to complete. As we were running short on time, Jill found tile contractor, Chad Greenslet, out of Bennington to finish our shower tile job. He installed the Schluter and tile in 2 days, but ran out of tile. We thought we had ordered extra, but somehow miscalculated. The extra tile arrived today, so that project should get finished up next week. 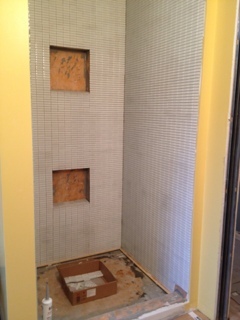 Jill is also working with a local glass supplier to install a frameless shower door. The site-cut maple intended for our stairs is still drying out in our basement. At some point soon we’re going to have to decide if it will be ready in time, or if we should purchase other material for the stair. 95% of the trim is installed. The holes have to be filled and cracks caulked before it gets painted. Doors have to be painted too. Jill is hoping to get the two bedrooms finished this weekend so we can start moving some stuff into them. Also, a few pieces of siding trim for the basement entry have been sealed and are awaiting installment. But that is about it. We’re down to the final punch list. We have to be finished in two weeks for the mortgage appraisal. That is our other task – converting our construction loan over to a mortgage. More on that process soon as well. Our lack of regular updates of late should tell you we’re busy as heck. Between work, house and holidays, we haven’t had a moment’s rest. We’re desperately trying to get our certificate of occupancy before the end of the year. In the last couple of weeks we’ve finished all Sheetrock and taping, all window sills are in and most of the final electrical is in, including switches, outlets and fixtures. The big push has been the kitchen. The small half walls were completed last week and the appliances arrived on Friday. As of last night all Ikea cabinets had been assembled. There’s only a small bit of finishing pieces left. The countertop fabricators are at the house today to template the island and two small counter tops. The counters are scheduled to be installed the 29th. Other activities for this week include finishing electrical and plumbing. We also hired a tile guy to finish the shower this week. And trim is going up at a furious pace. The wood floor on the second floor is officially sanded and sealed. We used a clear satin finish from Vermont Natural Coatings. It’s pretty awesome stuff. The floors are beautiful. Jill applied 3 coats this weekend. Warren finished laying the first floor Friday. It will be sanded Monday and Tuesday and we’ll start sealing it Tuesday night. They recommend a full 7 days to let it cure. In the meantime Warren will be working on outside tasks and getting ready for stairs. 1. All electric. Gotta make use of our solar power. 2. Efficiency. You will have more flexibility if you’re willing to forgo having a matching suite. Luckily (?) there’s only a few design styles for appliances, so it’s still possible to have very similar looking pieces that could pass for a matching set if you don’t look to closely at the logos. 3. Size. We left no wiggle room, so the range and fridge had to fit in the 30″ space we allotted for them in the floor plan at the beginning. 4. Budget. Most efficient doesn’t necessarily have be the most expensive. Top Ten USA is an good website to start when shopping for energy efficient appliances as it compiles a short list of the most efficient products from the ENERGY STAR list and includes prices. For more detail or to broaden your search, you could use either the Consortium for Energy Efficiency (CEE) or the ENERGY STAR websites. The energy efficiency information in the product charts is similar on both sites, but the CEE also assigns a handy tier certification rating to products that qualify. The American Council for an Energy Efficient Economy (ACEEE) website has a good consumer resources section that offers shopping guidance and tips for saving energy. The major box store websites are useful for finding price ranges and reading user reviews. Be aware: The Energy Star program’s criteria for which models qualify changes as of January 20, 2012. Some appliances that could previously claim Energy Star status may no longer qualify, and showroom labeling might be outdated. FRIDGE: Whirlpool WRT359SFYM * $800-900 * CEE Tier 3 * 30% more efficient than federal standard. To save energy, we wanted a bottom or top-mounted freezer configuration, without an ice-maker or water dispenser, and under 20 cu. ft. in size. DISHWASHER: Bosch SHX500 Series * $800-900 * CEE Tier 2 * 27% more efficient than federal standard. Asko and Bosch models dominate the top of all the energy efficiency lists, but Bosch is more easily available in our area so it was the obvious place to start looking. We were looking for an Energy Factor (EF) of at least 0.65 or an estimated energy use of less than 340 kWh/year, low water use, a no heat dry option, delay start option, and quiet due to our open floor plan. This particular model has an EF of .83, energy use of 259 kWh/year, water use of 2.95 gallons/cycle, and a sones rating of 46 dBA. Bosch offers an overwhelming variety of dishwashers with an assortment of features – many with even lower energy and water use – so price was the biggest deciding factor here. RANGE: Electrolux Wave-Touch Series EW30IS65JS * $3199. (Ranges are not Energy Star rated.) To save money, early on we decided to install an electric range instead of a separate cooktop/oven, and the kitchen was wired with that in mind. I really wanted a slide-in model instead of a freestanding one – mostly due to aesthetics, but also to help keep grease and crumbs from getting caught between the cabinets and the range. Induction was intriguing but a bit outside of our budget, so we selected a conventional GE model with a convection oven in the $1200-1300 price range. In the beginning of November we started reconsidering induction as a more energy efficient option. While there are many induction cooktops and freestanding ranges available, the Electrolux Wave-Touch is currently the only slide-in range that has all the burners with induction. It just happened to be twice as much as the previous model we picked out and it never goes on sale. In hindsight, if we had known we were going to spend this much from the beginning we may have opted to have a separate cooktop/oven instead (and installed the appropriate wiring and cabinet configurations) just to have more flexibility and choice. As it is, we’re glad that if there’s only one model available, at least it’s a well reviewed one. We may have busted our budget with this, but we are both really happy we were able to switch to induction. Now I just have to buy some new stainless cookware to use with it. RANGE HOOD: Broan 41000 Series * $79-90. (Range hoods are not Energy Star rated.) We went ductless to preserve the integrity of the building envelope and our air sealing. Our ERV has a “boost” option in the kitchen and bathroom to quickly move air out of those areas, so this range hood is just for filtering grease/steam and supplying light to the cooking surface. We’ll let you know how this system works after we’ve used it a bit. Side note: We hadn’t planned to be buying our appliances in November, but since that’s how the timing worked out we decided to try to take advantage of Black Friday sales (a marketing event I’ve gone out of my way to avoid in the past.) 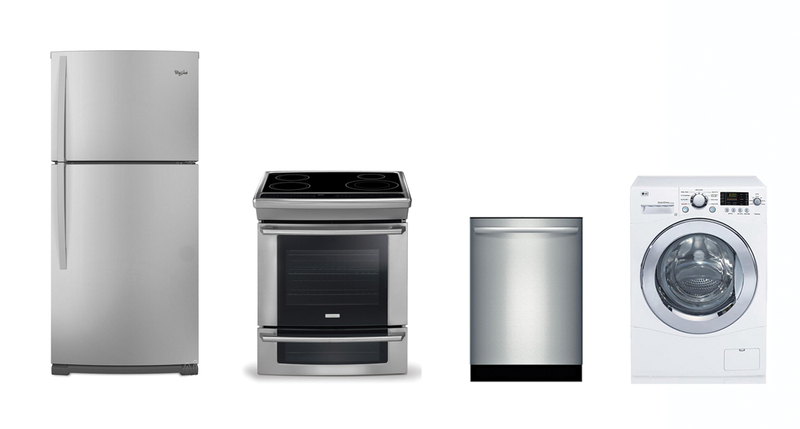 There seemed to be some really good deals on appliances that weekend, but not on any of the models we had selected. In fact, prices on each of these items were $50-100 more in November than they were over the summer. If I have to buy appliances again, I will be shopping the July 4th or Labor Day sales. On the other hand, the iPhone and iPad came in extremely handy when shopping at stores that offered price-matching. They easily paid for themselves last weekend.